MSI, world leader in gaming hardware, released the Camo Squad Limited Edition series during Pinoy Gaming Festival! Selected from MSI's powerful gaming lineup, the GE62 Camo Squad aims to give you a sense of individuality, personal identity, and an incredible immersive experience as if one is participating in the actual combat. The military-themed notebook is designed to make combat feel more visceral and is definitely an array that military shooter fans wouldn't want to miss! 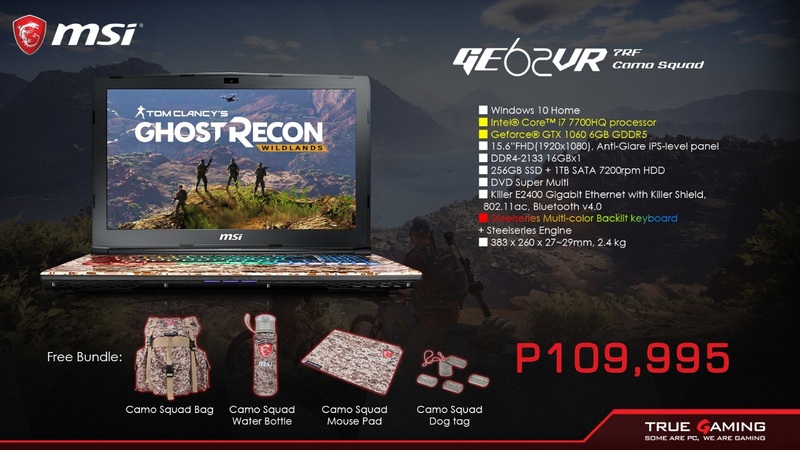 MSI Philippines just released Camo Squad during Pinoy Gaming Festival on April 29, 2017. On stage, MSI talked about the wonderful features and specifications of the unit, while presenting the actual unit on stage with MSI influencers. Better yet, MSI offers the following exclusive gifts: a camo backpack, a camo water bottle, a set of MSI themed dog tags, and a camo mouse pad. Show off your tough camo style in game-play and in daily life.